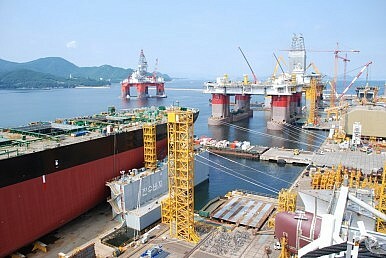 Can the South Korean state arrest what looks to be an imminent crisis in the shipbuilding industry? The Korean shipbuilding industry has plunged into a deep crisis. The three biggest shipbuilding firms—Daewoo, Hyundai Heavy, and Samsung Heavy—posted record combined losses in 2015, and 2016 looks no better. Combined with a major accounting scandal and ongoing concerns about the viability of the market, South Korea could face a major shift in the viability of one of its most important industries. A collapse in world energy prices, combined with the overproduction of ships in the early part of this decade and the general sluggishness of international trade, brought about this situation. And a larger problem looms: The growing Chinese shipbuilding industry can produce adequate ships at lower cost. Even if demand recovers (and some project that this will happen by 2020), Korean shipbuilders will need to contend with their newly formidable Chinese competitors. The shipbuilding industry is immensely important to the South Korean economy, and to South Korea’s international position. The sector commanded roughly half of the global production of shipping in the early part of the decade. South Korea captured its share of the international shipbuilding market by aggressive government intervention, beginning in the early 1970s. At that time, the shipbuilding industry appeared moribund in traditional strongholds, such as Europe and the United States. The Seoul government, sensing an opportunity in a capital-intensive sector, allocated substantial support to the industry, while keeping labor costs low (often through repressive measures). These efforts were abetted by a dramatic drop in energy prices at the beginning of the 1980s, along with an explosion in the volume of international trade. By the mid-1980s many of the traditional shipbuilding nations (especially in Europe) had seen their industries wither, and the high value of the yen allowed South Korean shipbuilders to cut into Japan’s market share. The modern Korean shipbuilding industry employs more than 200,000 workers, with projections now estimating that 10 percent of that force could disappear over the next couple of years. Seoul has poured money into the shipbuilding industry of late, to uncertain effect. If the market for ships does not recover, South Korea cannot keep supporting the industry forever. Seoul’s biggest objective is to avoid the experience of European shipbuilders in the 1980s, in which massive government subsidies failed to revive a dying industry. Compounding the problem is a growing accounting scandal at Daewoo Shipbuilding. Reports suggest that the firm, the only one of South Korea’s shipbuilders to show a profit in recent years, has been cooking the books. This has caused obvious concern not only for the health of the industry, but also for the viability of state support. That said, Seoul has few good options; shipbuilding is far too important to allow the industry to wither on the vine. The obstacles to entry (which prevent new competitors from emerging quickly) are sufficiently large that it makes sense for the Korean government to continue to support the industry through lean times. The hope for South Korea is that these lean times don’t become a replay of the collapse of European shipbuilding in the 1980s. Should the next U.S. frigate come from the Pacific?